It's Facebook Fridays! for February 2, 2018, and you can be the beneficiary of legendary Hoodoo lore! 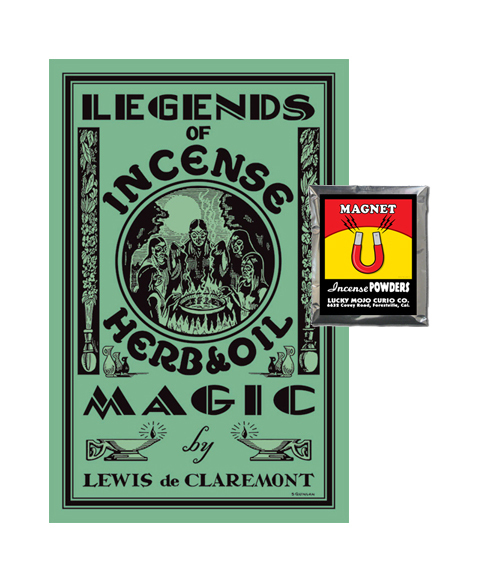 The Lucky Mojo Curio Company is holding a random drawing to give away 5 copies of Lewis de Claremont's seminal "Legends of Incense, Herb, and Oil Magic," first published in 1936, and now available in a beautifully restored edition. Filled with gorgeous illustrations, plus hundreds of tips, tricks, and techniques for working with natural herbs and old-school spiritual supplies, "Legends" is famous as the first book that described African-American candle magic, introduced the Seals of Moses into "drugstore" conjure, and provided drawings of the roots used in making mojo hands. In addition to the book, each winner will also receive a packet of hand-made Lucky Mojo brand Magnet Incense Powders, one of the great old-time products described in "Legends." First thing tomorrow morning, we will select FIVE winners at random, announce their names here, and ask them to message this Facebook Page with their mailing addresses, so we can send them their free Legendary Hoodoo products. We have a winner! In fact, we have 5 lucky winners! Our Facebook Fridays! winners for February 2, 2018 are: Krista Ravengael, Everet Lake, Clinton Combs, Rose Walker, and Mato Sapa Anatanpi.